Generally this light source is used for above Michelson Interferometer. Supplied with sodium vapour lamp transformer 35 W, sodium vapour lamp 35W & heavy metal box for sodium vapour lamp with electrical fitting. To demonstrate different conductivities of different metals. Rodsof 5 different metals and wood, fitted along one side of a metal tank. Laboware is presenting the product best in quality, To solve whole equations or numerical with different magenetic fields and ranges, Laboware is having firm solution with Laboratory Magenetic Kit. This kit contains all kind of Lab Magnets, which is perfectly helpful for either student or professional. 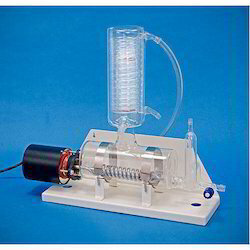 - The Serum Inspissator is made of Stainless Steel triple wall jacketed inner chamber. - Mild Steel sheet with powder coating. Electricity Supply: 1 Phase, 220 V AC, 3 kW. Air Circulation: By forced draft fan, Arrangement is done to vary the air flow rate. The case is made of aluminium, strongly mangetised cobalt steel needle fitted with imported hard axle rolls on knife edges agates and can be clamped when desired by a V clamp, a sensitive spirit level is provided. The tripod stand is provided with three levelling screws. Speed Control: 300 RPM to 1500 RPM. 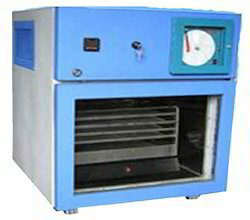 Brand: Reliable Lab Equipment Co. The two plates are supported in two rigid uprights and driven by belt in opposite direction. They are heavy, high resistance plastic with sectors of aluminium sheet. Two leyden jars (condensers) made from corning glass and aluminum foil. The whole machine is mounted on a wooden base. Exp-1 Determination the wavelength of He-Ne laser using diffraction grating. Exp-2 Determination the particle size of lycopodium powder.